Specifically the wire ones that DH gets with his drycleaning. The rest of the family likes plastic hangers, meaning there are TONS of these accumulating. So what better use for them than out in the garden? The kind used to cut metal or wire........like wire coathangers. Cut each side of the hanger at the shoulders. Then cut the long bottom side exactly in half. Leaving this. (Toss the hook part unless you have another creative use for it). 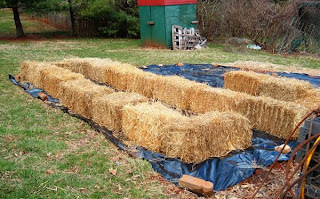 Here's the two ends, looking suspiciously like stakes, perfectly designed for holding down drip hose in any sort of garden: raised bed, tilled earth, lasagna or........wait for it.............straw bale! One can never have too many stakes for hose. And here they are serving their new purpose - just push them down over your hose every 2 feet or so. Keeping staking those miles of drip hose, using T-connectors where necessary, and caps at the endpoints. I love drip hose. To use the straight or T-connectors, just push the hose into the connector. 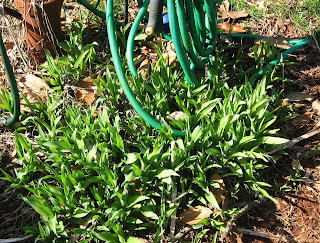 Drip hose lasts season after season and can be re-configured every year when I change my mind as to which way my garden is laid out. At the end of the gardening season, I watch the stores and buy up whatever hose and connectors are put on sale, stashing it away till the next spring. The yellow hose leading towards the camera is the main hose that connects to the yard spigot. The eventual goal is to have a water barrel here in the corner of this end of the garden, but I'm not entirely sure that it will have enough water pressure to push water through the permeable drip hose. Either way, the spigot water remains a backup, with the water barrel being a main source for water buckets. All that hose laid out and staked with the wirehanger stakes. Yes you can purchase "garden stakes" if you need them, but why spend your hardearned money if you have wire hangers around the house? They work for staking hose, black plastic, clear plastic tunnels for starting plants early, the list is endless. Occasionally when the drip hoses are first connected and turned on, there are geysers in unexpected places (that's what that odd brown root is marking). Then the water is turned off and that section of hose is cut and a connector put in. Or sometimes it's mended with duct tape. Depending on what I have available. Duct tape works, but is not the most aesthetically pleasing. 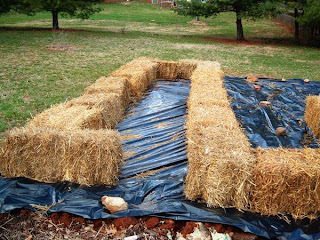 If you're planting a straw bale garden, and have laid and staked your drip hose, the next step is to spread a layer of soil over the drip hose. 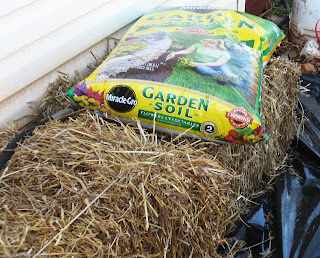 This afternoon I had enough garden dirt (not potting soil) to layer over the first U shape of the bales. 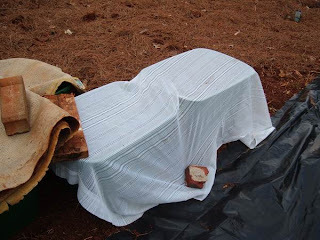 This early in the spring, this is all I need to prepare at this time. 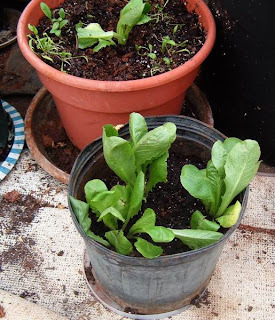 On the left arm of the U will be the melting sugar snap peas; along the back of the U spinach will be planted, and on the right hand side of the U, cauliflower. The peas (and later the beans) will do much better (no matter where they are planted) if this Granular Garden Soil Inoculant is used. After reading about it (and reading it was available in any garden supply store, which it wasn't) I eventually had to order it online from Planet Natural. It's easy to apply and non-toxic. Make a furrow in the dirt, add the seed, then sprinkle in the inoculant. The can above is enough for 150 linear feet (cost is $8.95 plus shipping). No danger of an overdose - the legume roots love it. 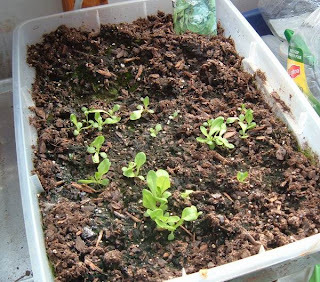 The idea behind it is that the bacteria (that's what it is -bacteria) clings to the plant roots, and pulls nitrogen out of the soil/air/straw/planting medium and making the roots thick and healthy. Then comes the fun part: writing the name on the little copper sign. I love these old-fashioned copper markers, and I pick them up at Target every year, in that $1 section at the front of the store. 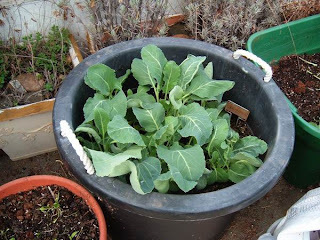 What I planted today: Melting Sugar Snap Peas, Cauliflower, and Spinach. All cold weather crops that will love to have the occasional chilly evening, and then the hot sunny afternoons. And if there should be a late frost or light snow, they'll be okay with that too. I won't, but they will. Disclaimer: No coathanger manufacturer has supplied me with coat hangers free of charge, and all Planet Natural did was accept my order and ship it to me for their customary charge. I can't remember the last time I got anything free. Definitely not the packets of seeds. Paid full price for them. Sure hope they grow. 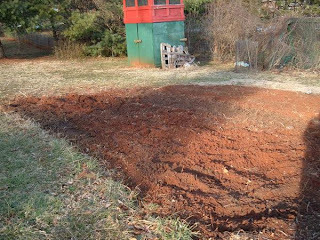 Also grabbed another bag of soil - this will be laid out on top of the bales, and the cucumber seeds planted there. Then watered every day, or every other day with the soaker hose. One day in June, the cucumber vines will be all leafy and green, and they will hide the soaker hose, and inevitably I will forget about it, then catch a glimpse, shriek, and kill the soaker hose with my hoe. I promise you this will happen. The daylilies are back at the spigot. I had three extra bales after finishing off the garage bed, so they were added to the yard. 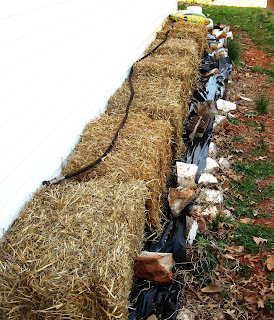 These bails will get soil, seeds or plants, and soaker hose as well. 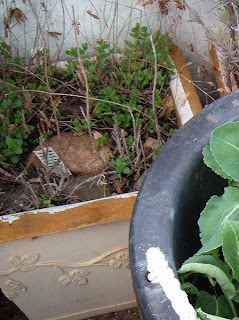 Something in the greenhouse is eating the tops off my broccoli and cauliflower. But only in those two tubs. the other blats and pots are left untouched. 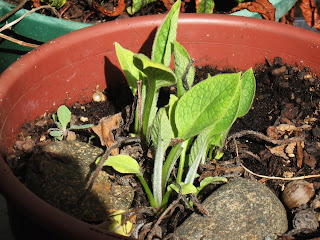 Comfrey is back! 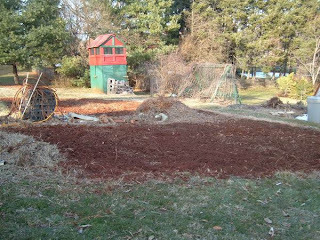 I think I'm going to add some more plants -I love the way I can use it for mulch and making fertilizer water, and, of course, comfrey salve. Tomorrow is repair day for one of the faucets that froze and broke, plus starting to get the pond water system thought out. I rearranged the straw bales again, just in time to catch a huge rainstorm that began wetting them down. 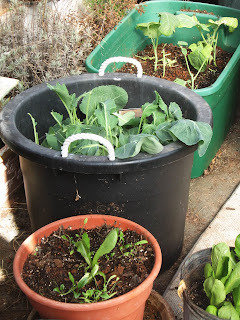 I'm thinking I can plant a few big container tubs and set them in the open area, or/and arrange gourd plants (they always cooperate and cover large amounts of area). I've been in search of the elusive legume inoculant that I need to sprinkle on the bales before planting peas or beans. Having no luck locally, I ordered it online from Planet Natural. I haven't used them before, so no recommendation yet. I did notice they have quite a few hydroponic supplies, and that's something else I've been wanting to try. While at the feed store looking for inoculant, I found 9-packs of romaine lettuce and picked up a couple. 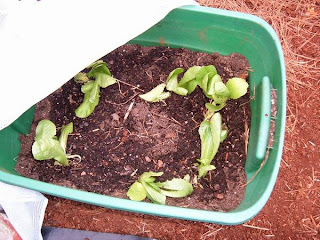 Twelve romaine plants went here, in big tubs, then covered with an old cotton curtain panel to keep out bunnies. It also filters the light and lets the rain come through. They'll look better after they recouperate from transplanting. 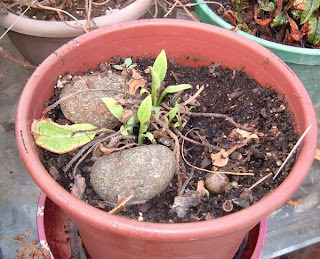 The remaining 6 plants were planted in the greenhouse - just stuck in wherever there was room. 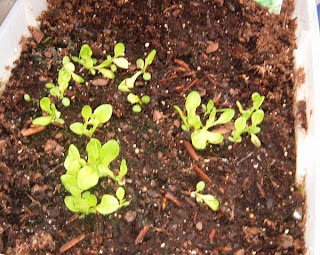 Meanwhile the romaine planted from seed is finally popping up. 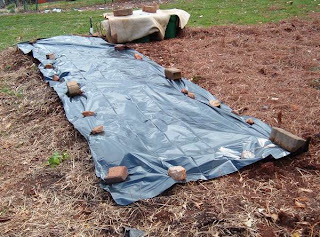 Also ordered a 60% shade cloth this weekend for the greenhouse -with its help, I'm hoping to grow lettuce and spinach all summer. It may seem nearly inconceivable now, but for each of you that plants a cucumber seed in May, there will come a time in July when you wonder to yourself "What the hell was I thinking????" 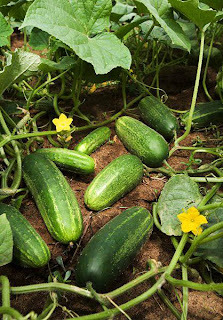 Your cucumber plants will be overflowing with blossoms and fruit, and you will be sick of cucumbers. Your co-workers will run from you, and you will be reduced to leaving unmarked brown bags of cucumbers on random doorsteps, simply to dispose of your overabundance of good fortune. This incredible list of magical uses for cucumbers was just received from a friend, who received it from another friend, thereby it's origins being lost in the mists of time and cyberspace. Print and save for that moment in July. That moment will come, I promise you. Cucumbers are a good source of B vitamins and carbohydrates that can provide that quick pick-me-up that can last for hours. Try rubbing a cucumber slice along the mirror: it will eliminate the fog and provide a soothing, spa-like fragrance. out or to the pool? 6. Want to avoid a hangover or terrible headache? Eat a few cucumber slices before going to bed and wake up refreshed and headache free. 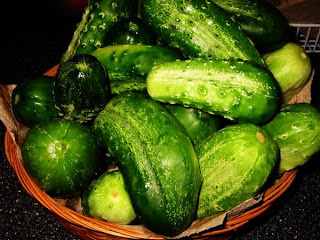 Cucumbers contain enough sugar, B vitamins and electrolytes to replenish essential nutrients the body has lost, keeping everything in equilibrium, and avoiding both a hangover and headache! Cucumbers have been used for centuries and often by European trappers, traders and explorers for quick meals to thwart off starvation. you don't have enough time to polish your shoes? Rub a freshly cut cucumber over the shoe. Its chemicals will provide a quick and durable shine that not only looks great but also repels water. 9. Need to fix a squeaky hinge? Cut up an entire cucumber and place it in a boiling pot of water. The chemicals and nutrients from the cucumber with react with the boiling water and be released in the steam, creating a soothing, relaxing aroma that has been shown the reduce stress in new mothers and college students during final exams. Take a slice of cucumber and rub it on the surface you want to clean; not only will it remove years of tarnish and bring back the shine, but it won't leave streaks and won't harm you fingers or fingernails while you clean. (Word from Chewy: For some reason this reminds me of the tip to rub your hands on a stainless steel sink to get rid of the onion odor after cutting onions. Take the outside of the cucumber and slowly use it to erase the pen writing. Also works great on crayons and markers that the kids have used to decorate the walls! If you know the origin for this list, let me know. I'd love to credit it. Progress is being made. I may even live through it. The black plastic is down (hopefully staying in place). Now the sun gets to bake the wiregrass. Well, except for the next 6 days, all of which are suppose to be rainy. 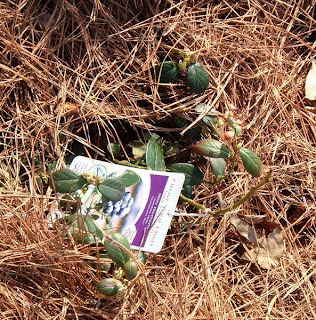 Just so you believe me about the blueberries, this is one of the babies surrounded by the blanket of pine straw. It already has green leaves and buds, and stands about 12" tall. 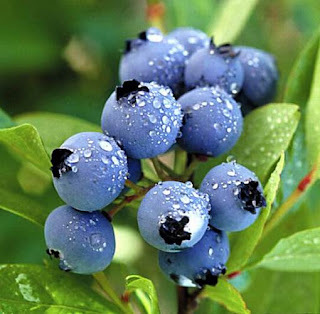 Since it's a 3-year-old plant, it *might* have one or two blueberries this summer. While it rains this week, I'll be planning my garden. 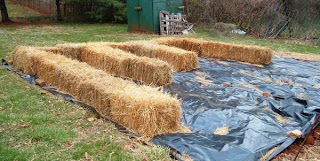 I'm wavering between an intense square-foot-garden layout, versus the straw bales, or a bit of both. 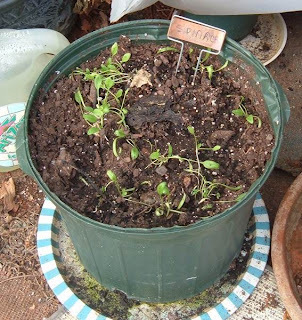 This is the week to start seedlings of lettuce, broccoli, spinach, onion, rosemary, oregano, and thyme. 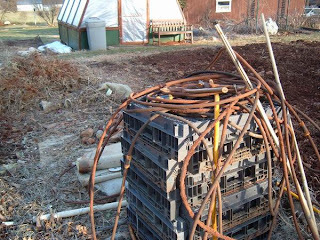 The warmer weather plants like potato, tomato, pepper, and basil can be started in the greenhouse, in order to be ready in 6-8 weeks when it's warm enough here in Virginia to set them out. Later this week, we'll discuss garden notebooks and why you really, really want to keep one. 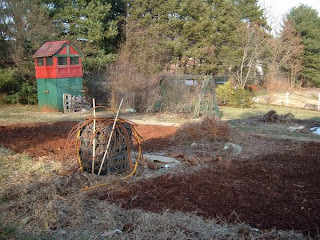 But the net result is that both newly tilled garden plots have been combed for the random strands of wiregrass. Tomorrow they will be covered in black plastic, with the goal of literally burning and baking the remaining bits and pieces of wiregrass runners/roots. Sortof like waving a torch at wild animals and hoping for the best. Meanwhile, we also replanted 20 blueberry bushes today. 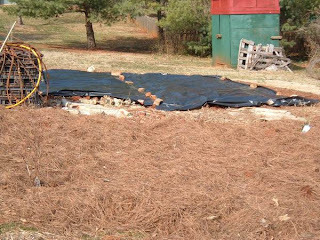 The process involves digging the hole, shaking out the blueberry roots while removing the wiregrass runners that bound them up last year, adding fertilizer and a bit of sulfur to each hole, then lining the hole with pine straw (keeps the soil acidic for the blueberries), adding the bush itself, giving it a long drink of water, then filling in with soil, and mulching again with an overall pine straw blanket. Then repeat 19 more times. 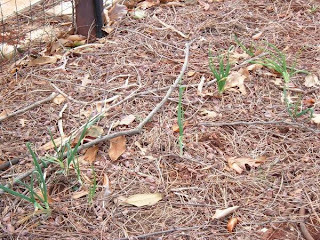 You can't see them, but under and in this pine straw are the 20 blueberry bushes. From left to right, there are 2 -six year plants, 3 -five year plants, 10- four year plants, and 5-three year old plants (the babies of the bunch). Someday they will grow up to be like these old-timers, approximately 5-6 tall and just as wide. That photo kind of makes it all worthwhile. That, and a handful of Advil. 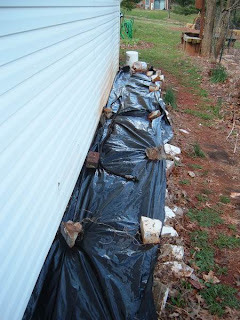 First we had to pull up all the rocks and bricks, and then the carpet paths the rocks were anchoring. 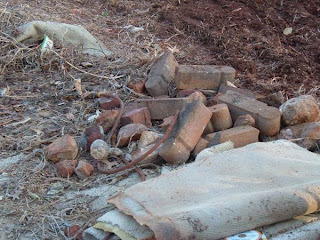 Almost all the carpet had to be tossed -the wiregrass had literally woven itself into the carpet fibers. A few pieces were salvaged. Then the drip hose was pulled up - found out a 10 foot section had hardened to the point of being brittle. Also removed and stacked the plastic racks that the gourds grow on (have I mentioned I found new gourd seeds a couple days ago: snake gourds, swan gourds, apple gourds and....nest egg gourds). 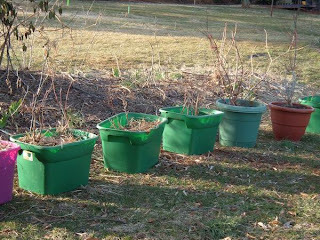 Lastly, before roto-tilling, we dug and temporarily potted the blueberry bushes. Discovered the wiregrass had grown into the roots and bound them. No wonder my poor babies didn't grow much last year. 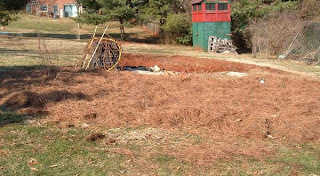 Then we raked up all the loose mulch and straw, piling it up to be removed with the bad carpet. There's one strip left of wiregrass on the lefthand side - we'll get it tomorrow. All of this tilled dirt has to be gone over with a rake, clump by clump, so we can remove the wiregrass runners. Have I mentioned that wirefrass is The Devil? Plan B is a flamethrower.